One theme I often see in New Year’s sewing resolutions is an emphasis on sewing from one’s “stash” rather than purchasing more new fabric. I don’t know too many serious sewers who don’t harbor at least a little guilt about all the fabric they have squirreled away (the word “stash” actually does imply something put away, usually in a secretive place!). I used to feel a lot more guilt about all my fabric than I do now, and here’s why. First, I don’t consider my fabric a “stash” of anything. I look at it as a collection, to be used, admired, and taken care of like any valuable thing. And second, I believe having a selection/collection of beautiful and inspirational fabric adds to the creative process of sewing. Many new synthetic fabrics were being developed in the post-war era, as evidenced by the many ads from manufacturers of these yard goods. Here is an ad for acetate, made by the Celanese Corporation of America. 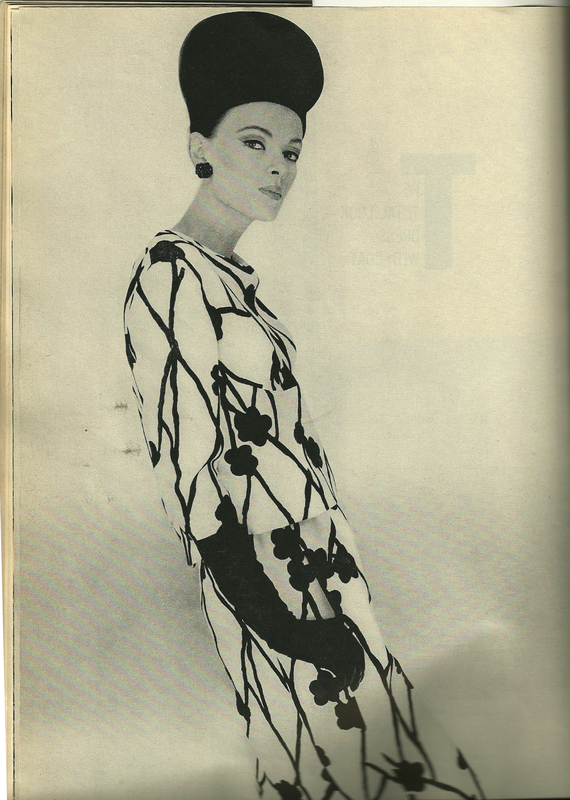 It appeared in the February/March 1957 issue of Vogue Pattern Book Magazine. 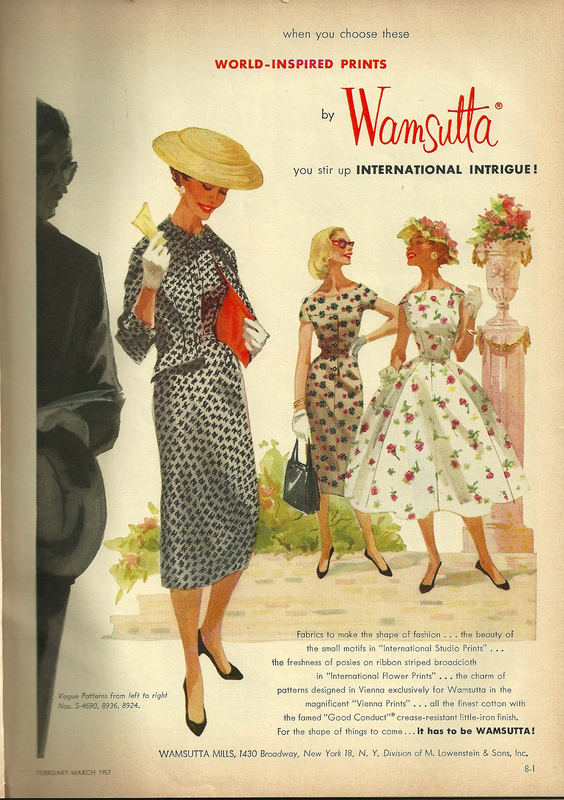 In the same issue was this full page ad for Wamsutta cotton prints. Now known primarily for sheets, Wamsutta once had the tagline “it has to be WAMSUTTA!” which many a home sewer knew as a sign of quality. I want to show you something else in that same issue. 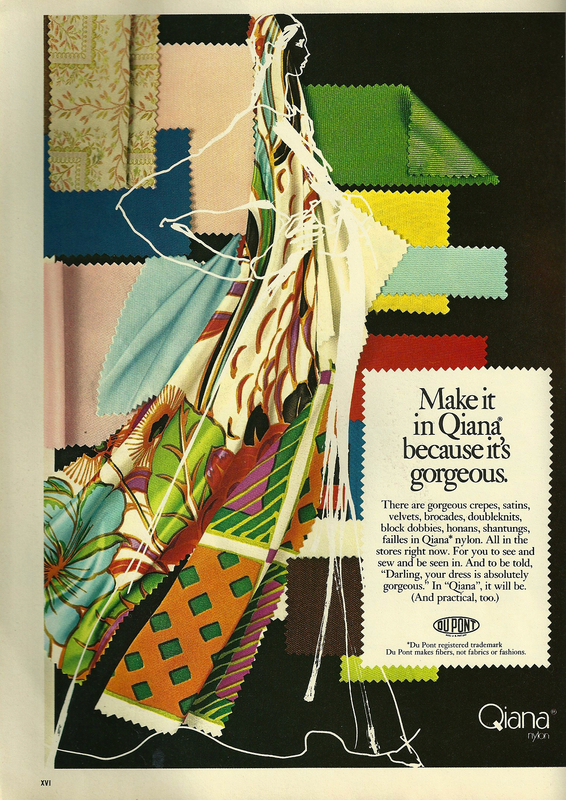 Although there was not a dedicated ad for American Silk, Vogue pattern #6105 was sewn in American Silk, as stated in its accompanying caption. How I would love to find a piece of this silk tucked away in some drawer! 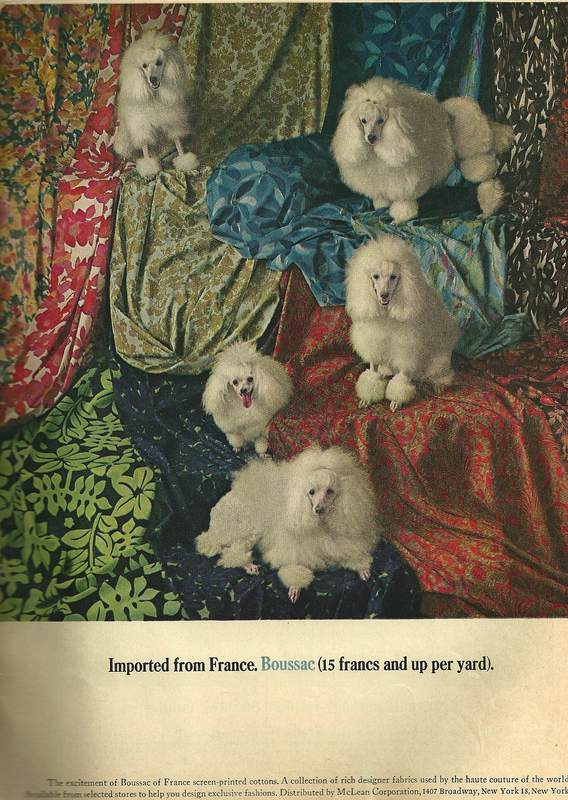 Twelve years later, in 1976, I attended a fashion show featuring the various dress silks made by this company for the home sewing market, another example of the effort put into marketing by specific fabric manufacturers. 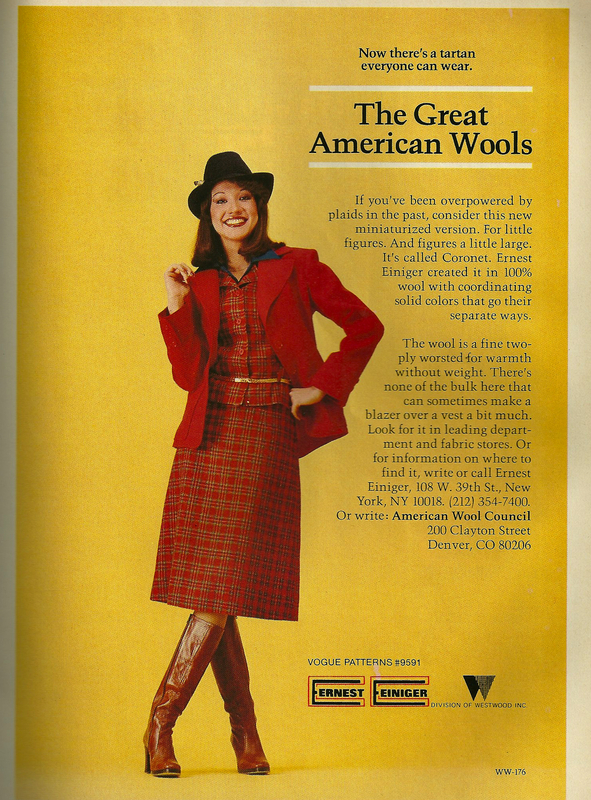 In September/October 1976, Diane von Furstenberg was featured on the cover, and Ernest Einiger had a full-page color ad for “The Great American Wools”. In the same issue, Britex Fabrics in San Francisco offered a buy-by-mail offer for Ultrasuede, the “it” fabric of the decade! This is a loosely woven linen and cotton blend I purchased from Mood Fabrics a while ago. It is patiently waiting to be cut and sewn . . . This is a vintage linen, newly acquired by me. 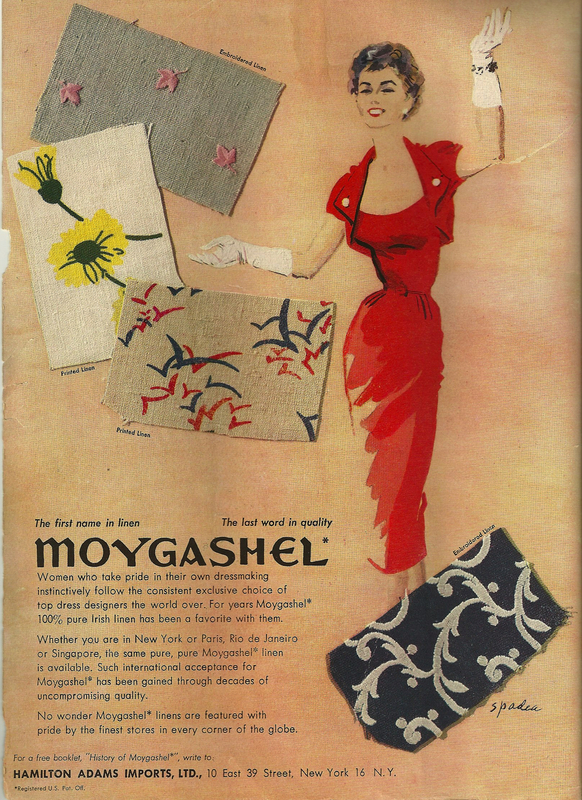 Although there is nothing printed on the selvedge, I believe it is a Moygashel linen from the 1950s. I plan to make a sheath dress from this fabric sometime during the Summer of 2014. William Blake notably said “The road of excess leads to the palace of wisdom.” I must confess I never knew what that meant until I applied it, somewhat sheepishly, to collecting fabrics. It seems the more various and beautiful fabrics I can look at and choose from, the more I am able to determine the perfect pattern with which to pair them. If I own the fabric already, so much the better! Sometimes the fabric dictates the sort of garment I should make and sometimes I have a pattern which leads me to my (excessive?) fabric collection, where I can admire anew and oftentimes choose a long-before purchased length of the perfect silk, linen, cotton, or wool. It is a back and forth process, one filled with visual and tactile components, demanding – and developing – sewing wisdom. It is one of the reasons I love to sew. Oh, Karen. You have made me feel sooooo much better about my “collection”! Not a stash, as in a hidden addiction, but a collection to inspire me as I sew! I, too, have a few names I look for when buying fabric. Thanks for another fabulous post — and for some guilt-free buying! You are so welcome, Cissie! “William Blake notably said “The road of excess leads to the palace of wisdom.” ” I like this! Thank you for sharing. I’ll never feel guilty about my stash again. I agree that it’s inspirational to look at my stash. Problem is, I don’t like having my stash in the sunlight in case it fades – the Aussie sun is FAMOUS for that! I keep my fabrics in sturdy storage boxes, arranged according to type of fabric, ie., linen, silk, etc. It’s so convenient to pull them out from the closet shelves (which I had designed to hold fabric) and admire the contents! Yes, I would definitely keep them away from an Aussie sun – or any other type of sun! Thanks so much for your comment! I am one of those who firmly believes that if I fall in love with a fabric, it needs to come live at my house! Then we are kindred spirits, indeed! So nice to hear from you! “Collection” is the perfect word for all the fabric you own! I do have quite a few pieces that need to properly “age” before they are ready to be used though, hehe. I guess I’ve never really thought of the word “stash” as being such a bad/guilty thing because, as I kid, I always wished I had my own collection to dig through if I wanted to make something. Now that I’m an adult, I feel a sense of accomplishment when I already have almost everything I need for a project. I love love LOVE your polka dot fabric and the happy floral print! I can’t wait to see what you make with them! I agree that sometimes fabric has to age before it is ready for prime-time! I, too, love the polka-dot linen – I just keep thinking about how versatile it is with all those luscious colors. Great post, such interesting ideas about one of my favourite things: fabric! Thanks so much! 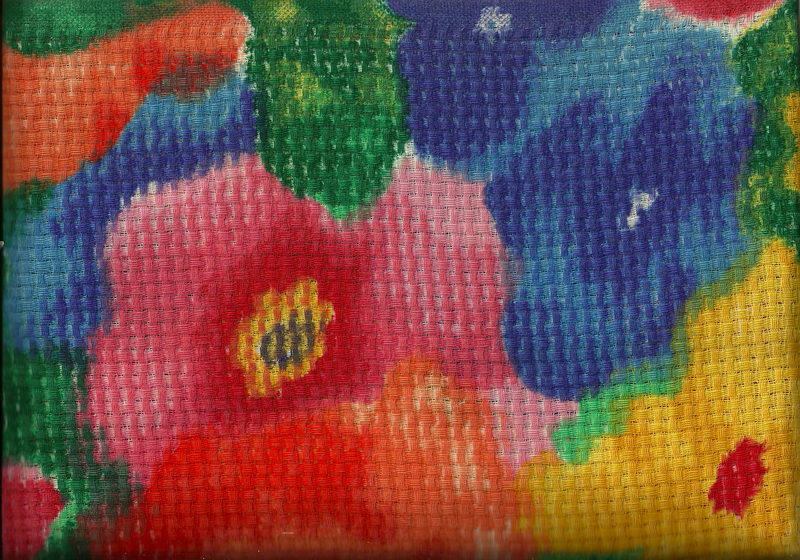 There is nothing quite like a beautiful fabric! So well put. 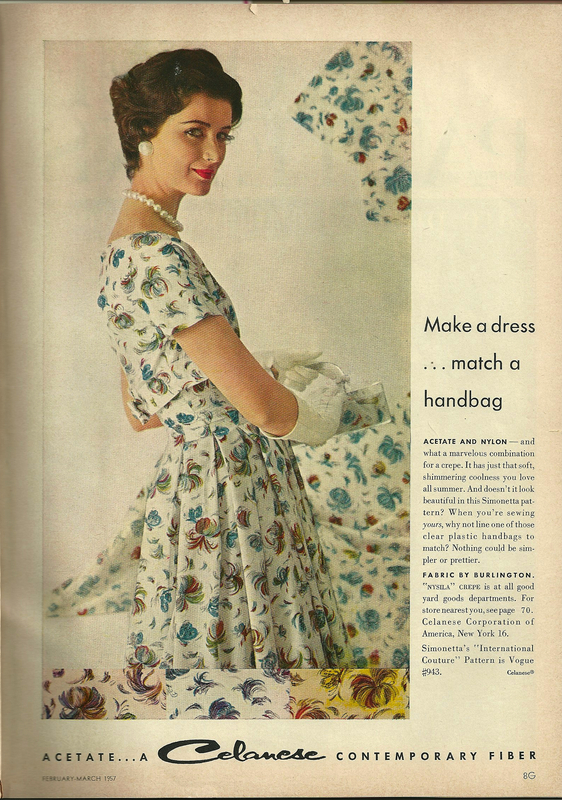 And your dotted linen! I’ve noticed in the past few years that some savvy clothing and shoe manufacturers have been partnering with the few remaining well-known textile makers, and have been marketing the collaboration to their advantage. J. Crew does shirts using Liberty fabric, Converse has used Marimekko and Liberty, Nike has worked with Harris Tweed and Pendleton does partnerships all the time, including the grungy St. Laurent collection of 2013. It is encouraging! I’ll have to look specifically for more of these collaborations with textile manufacturers – thanks for the heads up! 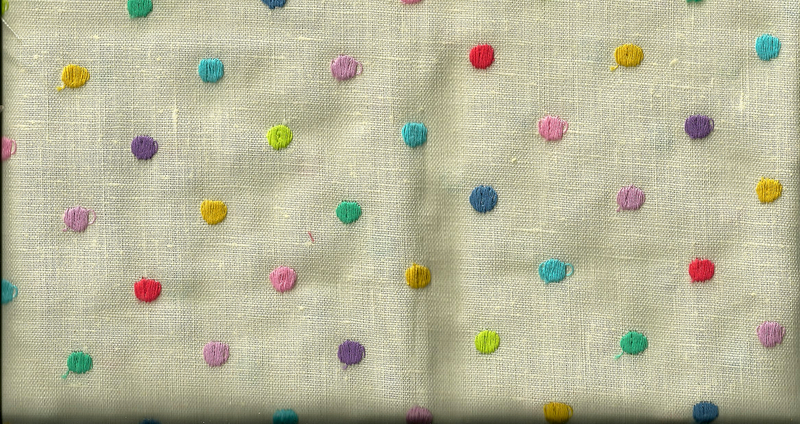 And – the dotted linen is an amazing piece of fabric – even better in person! My wedding dress, circa 1973 is Moygashel linen.Thank you for the history lesson! I, too, was married in 1973, and although I made my wedding dress, it was, alas, not out of Moygashel. I bet yours was gorgeous! I did, however, make a dress out of a printed Moygashel to take on our honeymoon. That dress is still one of my all-time favorite frocks. I have no guilt about my collection except when I buy a fabric to make something for the kids then use it for myself! And I do remember the things I have made (those I have been proud of anyway) and the fabric I made them from, but I think as I sew more things I am proud of I may need to keep a notebook too. Particularly as I learn how various fabric handle and behave and so forth. I should add “start a fabric notebook” to my resolutions for 2014! 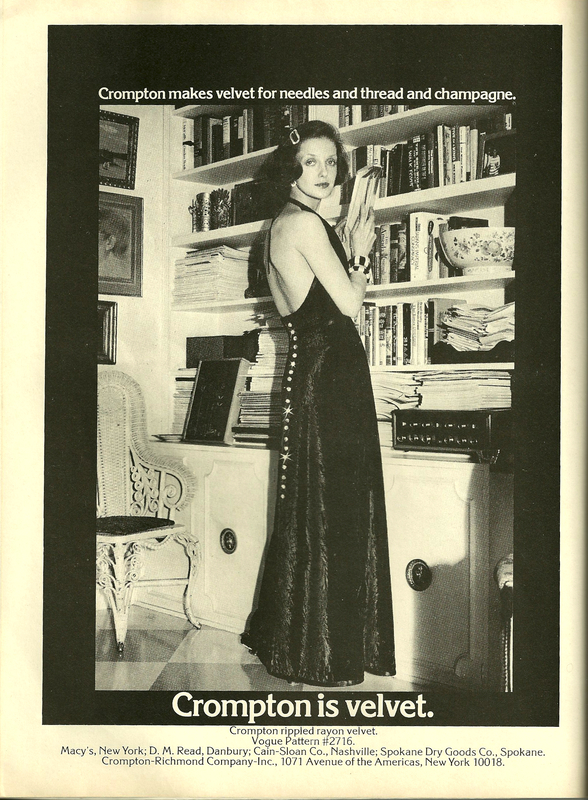 If only I had a time machine to go fabric shopping (oh and I might pop into Biba too)!